How can I hatch my Companion egg? First, you must access the Companion page by clicking on the egg icon next to your character’s icon. Once on the Companion page, you must have an Incubator in stock to start the hatching process. If you do not have one, you can buy an incubator in the Companion Shop. Now, click the egg and slide it into the Incubator. The hatching process will start automatically, you’ll just have to wait! You can accelerate the hatching process by paying with Gold Coins (available in the Bank). How can I feed my Companion? On your Companion page, you can feed your Companion by clicking the “Feed” button. A pop-up will appear indicating the number of food items you have in your Inventory Stock, and the quantity available in your Companion Stock (available for your Companion). To fill your Companion’s stock, select the quantity that you wish to give it by sliding the selector left and right, then click “Feed”. How do I evolve my Companion? The evolution conditions for each Companion are different. Note:[/u] After an evolution, the number of active days of the Companion will be reset to zero. Your Companion will only evolve if you ask it to and if it’s not exploring. How do I send my Companion to explore? On the Companion page, you must click the blue title bar below the avatar of your Companion to access the City of El map. 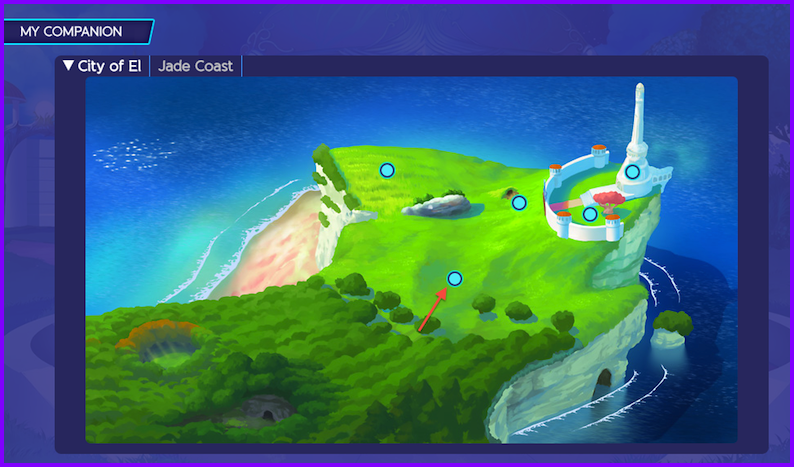 The blue dots represent a place your Companion can explore. Each exploration will cost your Companion between 10 and 40 Energy Points. Different treasures can be found it each place. The time of exploration can also vary between each place. Note[/u]: If your Companion doesn’t have anymore energy, you will have to wait until the following day, or purchase and use a Companion Energy Potion in the Alchemy Shop. What can my Companion find while exploring? It can find things such as (but not limited to) food, different baits, alchemy items, items to personalize your avatar, etc. It can also win or lose energy and/or affection. If you have all the common objects from a place, you will have to find the rare objects, which of course are more difficult to find. Your Companion may come back from an exploration empty-handed, or it might meet a friend and forget to explore the area you sent it to^^. What are the differences between each Companion? Each Companion is unique, but the main characteristics (i.e. the quantity of energy available or the evolution characteristics) are identical within the same species. Only the level of luck can change from one Companion to another. For example[/b]: Your Becola will always have a different level of luck than another Becola. However, they will all have 90 Energy Points. Each Companion has a different food and a different bait that it is attracted to. What happens if I put my Companion back in its egg? Putting your Companion back in its egg is not like a reset. Your Companion will keep its evolution, so you won’t have to evolve it again. Its luck level doesn’t change either. However, its affection level goes back to 20% no matter the original level of affection. The food available in the “Companion Stock” will be transferred back to your “Inventory Stock” (if there is enough space), and can be used for another Companion of the same species. Energy Points are the level of your Companion’s energy, which allow it to go explore. The energy level is refreshed everyday as long as your Companion has food to eat. What is the Affection Level? The Affection level indicates whether your Companion likes you or not. It will go up if you take good care of your Companion, but it can also go down if you neglect it or you don’t feed it. If your Companion’s affection level drops to zero, your Companion will return to its egg. The Affection level of your Companion is also one of the conditions for its evolution. You can find Affection points while exploring. You can also win 2% of affection per day if your Companion has food available in its stock. What does a Companion’s luck level do? The level of your Companion's luck determine's their ability to find rare items while exploring. This level varies from one Companion to another. Objects have their own level of probability of appearing. When your Companion evolves, its Luck Bonus may remain the same, go up or go down[/u]. How can I change my Companion’s name? When an egg hatches for the first time, you can name your Companion by clicking the “Rename” icon (to the right of the screen). Following this first name choice, you can pay 100 Gold coins to change the name of your Companion. How do I put my Companion back in its egg? 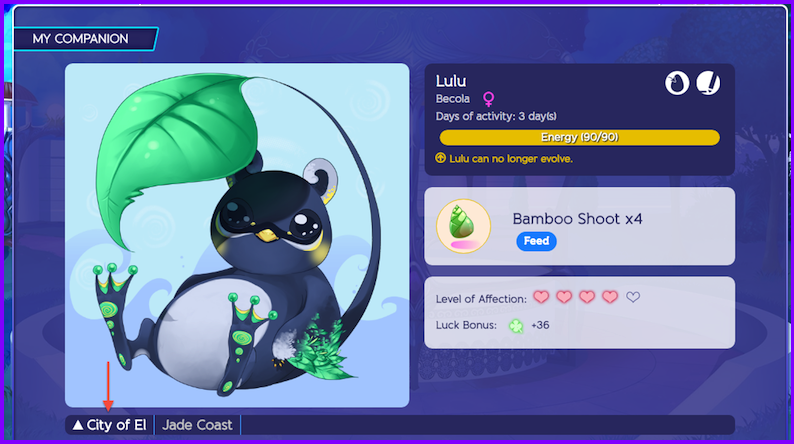 Go to the Companion page and click on the icon containing an egg with an arrow (“Put back in egg”), located to the right of your Companion’s name. 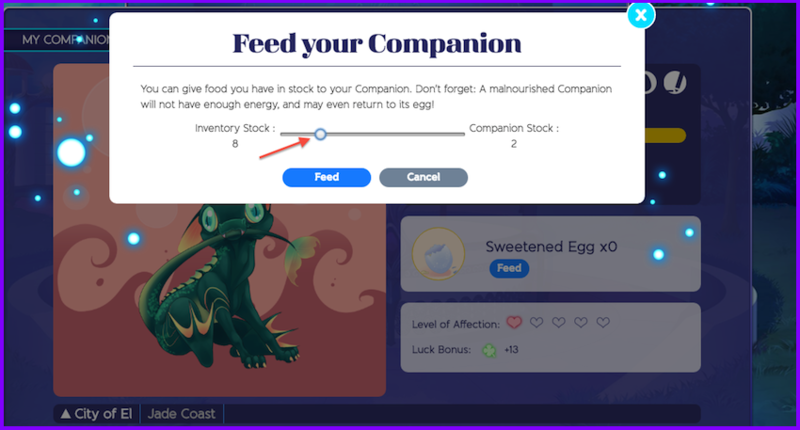 The food in the Companion Stock will return to your Inventory Stock (if this transfer doesn’t put your Inventory Stock over the limit) and can be used for other Companions of the same species. If you put your Companion back in your egg, you will not be able to explore or play the mini-games until you hatch another egg. Why did my Companion go back in its egg? If you don’t take care of your Companion, they will return to their egg. If you don’t feed your Companion, its affection will drop little by little down to zero. 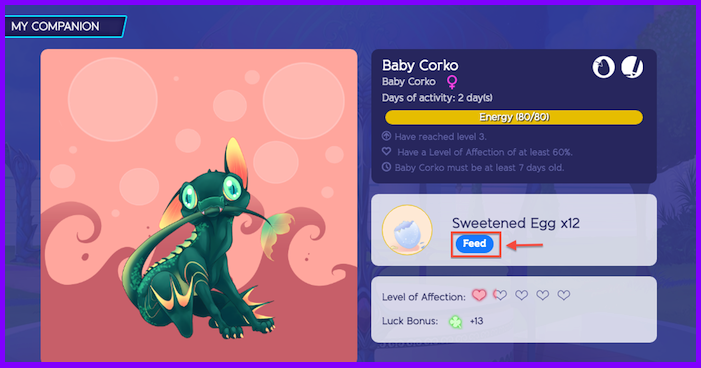 A companion who doesn’t have any food available loses 20 Energy Points per day. Once the energy is all gone, it will lose 10 Affection Points per day. /!\ Once the level of Affection has reached zero, the Companion will return to its egg.